Thank you for your interest in employment at the Duquesne Club. We are committed to integrity and quality, maintaining positive relationships with our members and creating unforgettable memories. Our mission is to employ the very best. 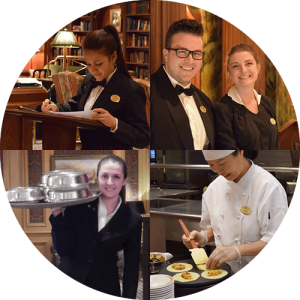 A career with the Duquesne Club is an opportunity to learn from some of the best leaders in the hospitality industry. We are driven to provide superior, distinctive, professional and attentive service to our members and guests. Let us know if you have what it takes to be a member of our exemplary team. For more information contact Terri Kingenberg, Human Resources at tklingenberg@duquesne.org.